Update: Please check out the "Angry Birds" button in the top right! 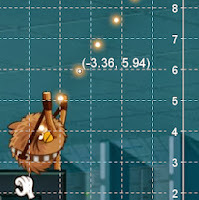 I tried out the popular game Angry Birds the other day, and began thinking, "What excuse can I have to play this more?" Using it in a lesson, perhaps? 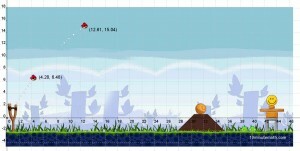 An Angry Birds Math Lesson! Solve a system using substitution and voila - we know where the bird will land. This last part will take some guidance, so here's a handout. You may want to import the basic image into Geogebra (click the little arrow on the Slider Tool to show a drop-down menu) and have your students play with it first. Don't watch the results until you've tried it out! Let me know if you students like having Angry Birds teach math!